As livelihoods became more certain, men sent for their wives. 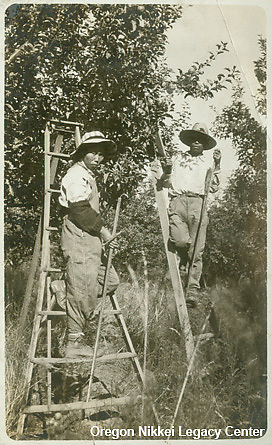 The Issei women were often surprised by their circumstances but persevered, working alongside their husbands, often in very rustic conditions. Marriages were almost always arranged, as was the custom in most Japanese families. Sometimes the bride and groom did not meet until their wedding day, having seen only photographs in advance. Newly married couples arrived from Japan. Weddings also took place in the U.S. aboard docked steamers and on shore in the port cities of Seattle and Tacoma, Washington. Photo: ONLC 317, Gift of Frank Yasui.